Welcome to TINYpulse! We're so glad to have you. The most fundamental component of TINYpulse for employees is responding to your TINYpulse survey. Giving regular feedback is a critical component to a happy and transparent workplace and you should be thrilled your leaders have provided TINYpulse for you as an outlet to give them feedback. You can access TINYpulse Engage in a few different ways. Survey email: From your email inbox, click the link in your weekly survey email if you're a new user. This will bring you to the survey page on your web browser where you can respond to your pulse survey, send Cheers, and give suggestions. TINYpulse website: After you set your TINYpulse password, you can log into https://app.tinypulse.com whenever you'd like. From here you can respond to an open pulse survey, send Cheers, or give an anonymous suggestion. Mobile application: TINYpulse has an app for iOS and Andriod where you can do everything! Visit the App or Play store to download it to give feedback whenever inspiration strikes. Slack: If your admin has enabled TINYpulse for Slack, you can do everything "TINYpulse" without ever having to leave your Slack app! Depending on your company, you'll receive an email in your inbox weekly, once every two weeks, or once every four weeks with a new TINYpulse survey. Surveys are always delivered on Wednesdays so keep an eye out for it! If you're a new hire receiving Onboard pulses, head on over to this article to get started. If you're hesitant to put yourself out there and give candid feedback to your leaders, you're in luck because TINYpulse Engage* is 100% anonymous for employees. Really. We here at TINYpulse are completely committed to protecting your anonymity. Our product only works if we closely abide by strict guidelines of anonymity. Your administrators have no access to information about who submitted which response, even if they ask us. You can be completely assured that your identity is completely hidden and is never revealed to anyone by us here at TINYpulse. You can find out more by reading our commitment to anonymity or emailing us at support@tinypulse.com. *TINYpulse Engage pulses are 100% anonymous, but Onboard surveys for new hires are not. Onboard is designed to facilitate the employee/manager relationship to ensure new hires are set up for long term success in their roles, so responses are not anonymous and are labeled accordingly. Apart from being 100% anonymous, another awesome thing about TINYpulse Engage is that it's "tiny". Forget about those annual employee surveys that take an hour to complete then go into an abyss where you never even know if your response was seen. Our mission is to keep everything quick and easy for both employees and admins to create a continuous, "tiny" feedback loop. Again, based on your company's pulse cadence, you'll get that survey email in your inbox from happiness@tinypulse.com. Note that the email will not come from an internal email address. It will come from TINYpulse directly so you can trust us to keep your responses safe. The question itself will appear in the subject line and also in the email text so you know what you're responding to. Click the link to open the employee portal. Enter your response plus any additional feedback you have and submit on the main Dashboard page in the first box. You can also send peer recognition called Cheers and give an anonymous suggestion to your administrators. Alternately, you can just open Slack or the TINYpulse mobile app directly to respond. This way you don't have to worry about keeping track of emails and you can respond whenever you have a moment to spare. Unfortunately, you can't change your response on your own once you've hit Submit. However, there are certain special cases where you mistakenly reveal your identity, say something that could jeopardize your employment, or do something else that would merit an emergency response from us to delete your feedback. In these cases, please contact us at happiness@tinypulse.com so someone from the Customer Success team can remove your feedback. 3rd sentence in the intro paragraph: "The most fundamental component of TINYpulse for employees if responding to your TINYpulse survey." - should be "is responding to your TINYpulse survey." the "Slack" bullet under Access TINYpulse: "If you're admin has enabled TINYpulse for Slack, you can do everything "TINYpulse" without ever having to leave your Slack app!" 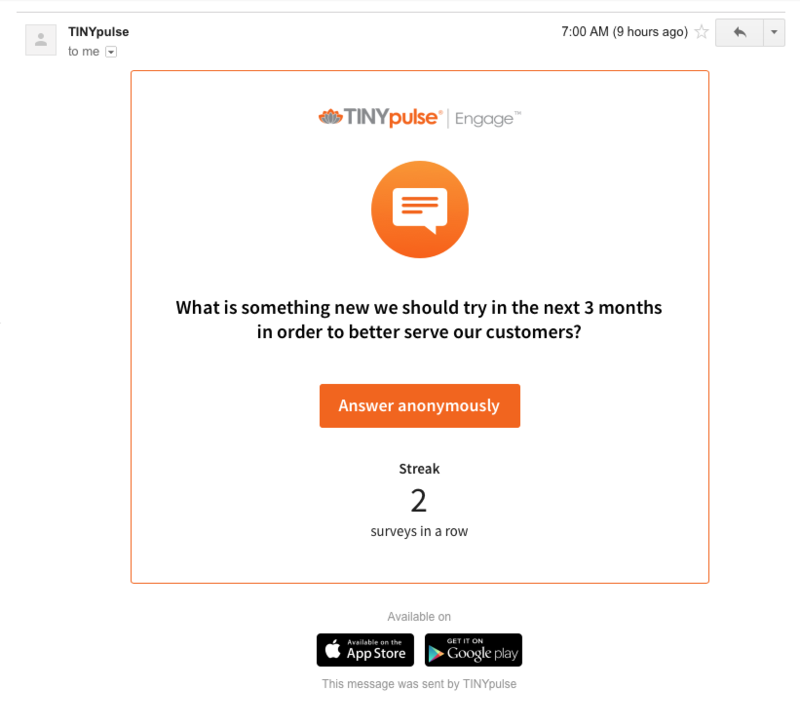 - should be "If your admin has enabled TINYpulse"
2nd sentence under "Respond to your TINYpulse Engage survey": "Surveys are alway delivered on Wednesdays so keep an eye out for it!" - should be "Surveys are always delivered on Wednesdays, so keep an eye out for it!" Thanks Heather! Appreciate your keen eye.